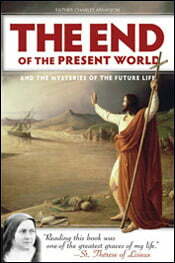 Mystery book on `End Times’ reappears! It’s one of those books that come out of nowhere – almost literally – just when the world needs it most. Is it all correct – what it reveals about the future, both for the world and the soul? From the vantage point of earth, who can say? It is written by a human. Completed in 1881 by an aged French priest, this remarkable book surfaced long enough to draw Thérèse into the convent and then, for more than a century, plunged back into obscurity. Now we offer you the very first English translation of this hope-filled, chilling work. Doesn’t that sound eerily like America just a year or so ago? Fr. Arminjon insists that we “steer clear of every perilous opinion and make no assertion that is not justified by Tradition and the doctrine of the Fathers.” Yet it’s precisely his sober reliance on Scripture and Tradition that makes this book so convincing . . . and so chilling! But Fr. Arminjon doesn’t merely sketch the darkness ahead; he also shows how Jesus will fill that darkness with light; and he details the rich bounty Christ has in store for all who stay faithful. That’s what caught Thérèse up in such fervent love of God, nourished her impatience for Heaven, and confirmed her decision to choose a life wholly consecrated to Divine Love. The End of the Present World and the Mysteries of the Future Life: let it show you how to read the signs of the times and prepare you to bear yourself as a Christian (as it did Thérèse) . . . no matter what the future holds!